This blog will not be my usually brief and entertaining style. It is a collection of many articles which I have read to try and understand what exactly is happening with the NWO and the future stability of global economics. The reading is tedious and only for those who are really interested in getting a handle on the realities underlying the current media propaganda on NWO and the G20. There are of course no answers: only interpretation and speculation. Yet, I refuse to resign myself to the placebo of recovery that has been liberally administered by the media lately. I wish to understand the underlying fundamentals - only then can I have an opinion which in not based on the thin air of propaganda generated by 'masters of the universe'. "The foundations of our economy are strong"
Retail sales fell in March as soaring job losses and tighter credit conditions forced consumers to cut back sharply on discretionary spending. Nearly every sector saw declines including electronics, restaurants, furniture, sporting goods and building materials. Auto sales continued their historic nosedive despite aggressive promotions on new vehicles and $13 billion of aid from the federal government. The crash in housing, which began in July 2006, accelerated on the downside in March, falling 19 percent year-over-year, signaling more pain ahead. Mortgage defaults are rising and foreclosures in 2009 are estimated to be in the 2.1 million range, an uptick of 400,000 from 2008. Consumer spending is down, housing is in a shambles, and industrial output dropped at an annual rate of 20 percent, the largest quarterly decrease since VE Day. The systemwide contraction continues unabated with with no sign of letting up. Conditions in the broader economy are now vastly different than those on Wall Street, where the S&P 500 and the Dow Jones Industrials have rallied for 5 weeks straight regaining more than 25 percent of earlier losses. Fed chief Ben Bernanke's $13 trillion in monetary stimulus has triggered a rebound in the stock market while Main Street continues to languish on life-support waiting for Obama's $787 billion fiscal stimulus to kick in and compensate for falling demand and rising unemployment. The rally on Wall Street indicates that Bernanke's flood of liquidity is creating a bubble in stocks since present values do not reflect underlying conditions in the economy. The fundamentals haven't been this bad since the 1930s. The financial media is abuzz with talk of a recovery as equities inch their way higher every week. CNBC's Jim Cramer, the hyperventilating ringleader of "Fast Money", announced last week, "I am pronouncing the depression is over." The Fed's balance sheet has become a dumping ground for all manner of toxic waste and putrid debt-instruments for which there is no active market. When foreign central banks and investors realize that US currency is backed by dodgy subprime collateral; there will be a run on the dollar followed by a stampede out of US equities. Even so, Bernanke assures his critics that "the foundations of our economy are strong". As for the recovery, market analyst Edward Harrison sums it up like this: "This is a fake recovery because the underlying systemic issues in the financial sector are being papered over through various mechanisms designed to surreptitiously recapitalize banks while monetary and fiscal stimulus induces a rebound before many banks' inherent insolvency becomes a problem. The rally in the stock market will not fix the banking system, slow the crash in housing, patch-together tattered household balance sheets, repair failing industries or reverse the precipitous decline in consumer confidence. The rising stock market merely indicates that profit-driven speculators are back in business taking advantage of the Fed's lavish capital injections which are propelling equities into the stratosphere. Meanwhile, the unemployment lines continue to swell, the food banks continue to run dry and the homeless shelters continue to burst at the seams. So far, $12 trillion has been pumped into the financial system while less than $450 billion fiscal stimulus has gone to the "real" economy where workers are struggling just to keep food on the table. The Fed's priorities are directed at the investor class not the average working Joe. Bernanke is trying to keep Wall Street happy by goosing asset values with cheap capital, but the increases to the money supply are putting more downward pressure on the dollar. The Fed chief has also begun purchasing US Treasuries, which is the equivalent of writing a check to oneself to cover an overdraft in one's own account. This is the kind of gibberish that passes as sound economic policy. The Fed is incapable if fixing the problem because the Fed is the problem. Last week, the market shot up on news that Wells Fargo's first quarter net income rose 50 percent to $3 billion pushing the stock up 30 percent in one session. The financial media celebrated the triumph in typical manner by congratulating everyone on set and announcing that a market "bottom" had been reached . The news on Wells Fargo was repeated ad nauseam for two days even though everyone knows that the big banks are holding hundreds of billions in mortgage-backed assets which are marked way above their true value and that gigantic losses are forthcoming. Naturally, the skeptics were kept off-camera or lambasted by toothy anchors as doomsayers and Cassandras. Regretably, creative accounting and media spin can only work for so long. Eventually the banks will have to write down their losses and raise more capital. Wells Fargo slipped the noose this time, but next time might not be so lucky. What happened to all those nonperforming loans and garbage MBS? Did they simply vanish into the New York ether? Could Wells sudden good fortune have something to do with the recent FASB changes to accounting guidelines on "mark to market" which allow banks greater flexibility in assigning a value to their assets? Also, Judging by the charts on the Internet, Wells appears to have the smallest "ratio of loan loss reserves" of the four biggest banks. That's hardly reassuring. Paul Krugman takes an equally skeptical view of the Wells report: "About those great numbers from Wells Fargo....remember, reported profits aren’t a hard number; they involve a lot of assumptions. And at least some analysts are saying that the Wells assumptions about loan losses look, um, odd. Maybe, maybe not; but you do have to say that it would be awfully convenient for banks to sound the all clear right now, just when the question of how tough the Obama administration will really get is hanging in the balance." The banks are all playing the same game of hide-n-seek, trying to hoodwink the public into thinking they are in a stronger capital position than they really are. It's just more Wall Street chicanery papered over with vapid media propaganda. The giant brokerage houses and the financial media are two spokes on the same wheel gliding along in perfect harmony. Unfortunately, media fanfare and massaging the numbers won't pull the economy out of its downward spiral or bring about a long-term recovery. That will take fiscal policy, jobs programs, debt relief, mortgage writedowns and a progressive plan to rebuild the nation's economy on a solid foundation of productivity and regular wage increases. So far, the Obama administration has focused all its attention and resources on the financial system rather than working people. That won't fix the problem. Deflation has latched on to the economy like a pitbull on a porkchop. Food and fuel prices fell in March by 0.1 percent while unemployment continued its slide towards 10 percent. Wholesale prices fell by the most in the last 12 months since 1950. According to MarketWatch, "Industrial production is down 13.3% since the recession began in December 2007, the largest percentage decline since the end of World War II"....The capacity utilization rate for total industry fell further to 69.3 percent, a historical low for this series, which begins in 1967." (Federal Reserve) The persistent fall in housing prices (30 percent) and losses in home equity only add to deflationary pressures. The wind is exiting the humongous credit bubble in one great gust. Obama's $787 billion stimulus is too small to take up the slack in a $14 trillion per year economy where manufacturing and industrial capacity have slipped to record lows and unemployment is rising at 650,000 per month. High unemployment is lethal to an economy where consumer spending is 72 percent of GDP. Without debt relief and mortgage cram-downs, consumption will sputter and corporate profits will continue to shrink. S&P 500 companies have already seen a 37 percent drop in corporate profits. Unless the underlying issues of debt relief and wages are dealt with, the present trends will persist. Growth is impossible when workers are broke and can't afford to buy the things the make. The stimulus must be increased to a size where it can do boost economic activity and create enough jobs to get over the hump. "In the Great Depression ... the U.S. government had a great deal of trouble maintaining its commitment to economic stimulus. 'Pump- priming' was talked about and tried, but not consistently. The Depression could have been mostly prevented, but wasn’t.... In the face of a similar Depression-era psychology today, we are in need of massive pump-priming again. It would be a shame if we are so overwhelmed by anger at the unfairness of it all that we do not take the positive measures needed to restore us to full employment. That would not just be unfair to the U.S. taxpayer. That would be unfair to those who are living in Hoovervilles...; it would be unfair to those who are being evicted from their homes, and can’t find new ones because they can’t find jobs. That would be unfair to those who have to drop out of school because they, or their parents, can’t find jobs. It is time to face up to what needs to be done. The sticker shock involved will be large, but the costs in terms of lost output of not meeting either the credit target or the aggregate demand target will be yet larger." "We are starting to see glimmers of hope across the economy." President Barack Obama, April press conference Even though industrial production, manufacturing, retail and housing are in freefall, the talk on Wall Street still focuses on the elusive recovery. The S&P 500 touched bottom at 666 on March 6 and has since retraced its steps to 852. Clearly, Bernanke's market-distorting capital injections have played a major role in the turnabout. Former Secretary of Labor under Bill Clinton and economics professor at University of Cal. Berekley, Robert Reich, explains it like this on his blog-site: "All of these pieces of upbeat news are connected by one fact: the flood of money the Fed has been releasing into the economy. ... So much money is sloshing around the economy that its price is bound to drop. And cheap money is bound to induce some borrowing. The real question is whether this means an economic turnaround. The answer is it doesn't. The only economic fundamental that's changed since then is that so many people got so badly burned that the trust necessary for consumers, investors, and businesses to repeat what they did then has vanished.... yes, some consumers will refinance and use the extra money they extract from their homes to spend again. But most will use the extra money to pay off debt and start saving again, as they did years ago.... I admire cockeyed optimism, and I understand why Wall Street and its spokespeople want to see a return of the bull market. Hell, everyone with a stock portfolio wants to see it grow again. But wishing for something is different from getting it. And cockeyed optimism can wreak enormous damage on an economy. Haven't we already learned this? (Robert Reich's Blog, "Why We're Not at the Beginning of the End, and Probably Not Even At the End of the Beginning") If the purpose of Bernanke's grand economics experiment was to create uneven inflation in the equities markets and, thus, widen the chasm between the financials and the real economy; he seems to have succeeded. But for how long? How long will it be before foreign banks and investors realize that the Fed's innocuous-sounding "lending facilities" have released a wave of low interest speculative liquidity into the capital markets? How else does one explain soaring stocks when industrial capacity, manufacturing, exports, corporate profits, retail and every other sector have been pounded into rubble? Liquidity is never inert. It navigates the financial system like mercury in water darting elusively to the area which offers the greatest opportunity for profit. That's why the surge popped up first in the stock market. (so far) When it spills into commodities--and oil and food prices rise--Bernanke will realize his plan has backfired. Message to Bernanke: Workers need debt-relief and a raise in pay not bigger bailouts for chiseling fatcat banksters. Pepe Escobar's Video, part 1 & 2. A lucid analyis of economic realities. Gordon Brown will enter talks with China today to see if it would be willing to commit extra funds to fighting a world recession in return for greater voting powers on multilateral institutions, including the IMF and World Bank. Brown will hold talks with Hu Jintao, China's president, following discussions with Barack Obama, amid signs that developing countries see the G20 summit as a chance to impose a new world order and end the era of Anglo-European dominance. Brown regards the remaking of global financial institutions as a key part of the summit and is optimistic that the Chinese will find extra money, even though Beijing believes western banking and morality have damaged the world economy. British diplomats see China's willingness to participate in the big international institutions as one of the few gains of the world recession. The Chinese have nearly $2trillion in foreign exchange reserves, and have become increasingly concerned at the security of their loans to the US. Brown has said he hopes to increase funding for the IMF to at least $500bn from $250bn. The EU has promised to lend an extra $75bn and Japan an extra $100bn. Obama, with whom Brown spoke on the phone yesterday on his plane trip to London, has offered an extra $100bn, so the Chinese, along with the Saudis, may make up the shortfall. The draft summit communique leaked at the beginning of the week was silent on how much extra funding should go to the IMF from bilateral borrowing, nor did it engage with how much extra money should go to multilateral development banks or how much extra money would be given over the next two years to support trade finance through export credit and investment agencies. In return for funding, the Chinese have been seeking more IMF voting rights, and the summit will agree to a review of these next year with the work completed by January 2011, earlier than previously planned. Similarly the World Bank will complete reforms to shareholding, voting and internal governance by next spring. The US has also agreed that the financial stability forum, a group of largely western finance ministers and bank governors, should be expanded to include all G20 countries and give it a stronger mandate as the financial stability board. The new membership will include Argentina, Brazil, South Africa and China. Robert Zoellick, the World Bank's president, emphasised the need to give multilateral bodies new powers, rather than just extra financing. In a speech in London yesterday Zoellick said: "If leaders are serious about creating new global responsibilities or governance, let them start by modernising multilateralism to empower the WTO, the IMF, and the World Bank Group to monitor national policies. "Bringing sunlight to national decision-making would contribute to transparency, accountability and consistency across national policies. "As a first step, the G20 should endorse a WTO monitoring system to advance trade and resist economic isolationism, while working to complete the Doha negotiations to open markets, cut subsidies, and resist backsliding." Until recently such a suggestion would have been dismissed by the major powers. It's a sign of fundamentally changed times that it's being taken seriously in many quarters, gaining support from India, Russia and Brazil and even an equivocal response from US Treasury Secretary, Tim Geithner. Two very obvious changes have prompted this reaction: First, there is a growing recognition that the course towards the current crisis was plotted when President Nixon severed the link between the dollar and gold in 1971. Second, the fact that, quite unlike any president before him, not only does Barack Obama believe in a more just and inclusive world, he also seems to recognise that creating such a world requires some levelling of the global economic playing field. The creation of a global reserve currency would be an essential first step in that process. In his paper, Zhou succinctly defines the qualities of an effective reserve currency: it should be anchored to a stable benchmark; its issue should be subject to clear rules so as to ensure an orderly supply; that supply should be flexible enough to permit adjustment as global demand for money changes; and it not should be linked to the currencies of any particular nation or nations. Zhou cites Keynes' Bretton Woods proposal for a super-sovereign currency – the bancor – the value of which, Keynes urged, should be linked to a basket of 30 commodities in order to insulate it from the the economic conditions and policy decisions of individuals nations. Back in 1944, the United States was not prepared to subordinate the dollar to a global currency over which it would have little control. Instead, the world settled for a system under which everyone fixed their exchange rates to the dollar, which was in turn linked to gold. That system lasted nearly three decades; but only now, nearly 40 years after its collapse, is anyone acknowledging the need to replace it. Currently five currencies – the dollar, the euro, the yen, sterling and the swiss franc act as reserve currencies. But with 65% of global foreign exchange reserves held in dollars, and with China holding more than a $1tn of these, no wonder the Chinese are getting jumpy. They fear the Obama administration's attempts to spend its way out of recession will erode the value of their foreign reserves. By switching to a neutral reserve currency before the spectre of inflation raises its head, their hard-earned savings would be protected. But the United States is unlikely to give up its reserve currency status without a struggle because it carries immense economic advantages, not least the capacity to run the kind of budget and current account deficits which would cripple other nations. Zhou's motivation is not a desire for greater global economic justice. It is, understandably, to protect China's interests at a time when millions of Chinese have yet to experience the benefits of his country's recent economic miracle. Russia's motivation is even more transparent: Dmitry Medvedev suggested that any new reserve currency should be at least partially backed by gold. As one of the world's leading producers of gold, this would put Russia at a distinct advantage. "the politics of global monetary management would be poisonous". But this misses the point. A reserve currency would only work if there was a widespread commitment to moving the global economy towards one in which co-operation between nations, rather than competition, was the defining feature. If the outcome of efforts to escape global recession is simply a return to business as usual, then a new reserve currency will have no chance. But even Evans-Pritchard concluded that "10 years hence the picture may look different, a world currency may come into being". That being the case, it should be done properly and for the right reasons. Zhou's suggestion that the IMF's special drawing rights (SDRs ) – a quasi currency established by the IMF in 1969 to try and save the ailing Bretton Woods system – should form the basis of a new reserve currency is unambitious and gives additional power to an institution too closely associated with the Washington consensus that systematically undermined development in the poorer nations. A better idea comes from the economic philosopher Richard Douthwaite. In his 1999 briefing for the Schumacher Society, the Ecology of Money, he argued that "an international currency should be based on the global resource whose use it is highly desirable to minimise". Today, obviously, that resource is energy. Douthwaite therefore suggests an energy-backed currency unit, or ebcu, as the international reserve currency. His excellent pamphlet can be downloaded for free, here. His proposal to link the international monetary system to the need to reduce carbon emissions, thus promoting both economic stability and environmental sustainability, is an idea whose time has surely come. China versus America: 'Great Game' for Global Order? The G20 summit in London ended with an optimistic note. But the final communique was a compromised document between the forces to preserve the basic architecture of the existing financial order and the forces to replace it with a new one: the first led by the Anglo-American partnership and the second by the BRICs with the support of the non-participating developing world. The Franco-German coalition took the intermediary position. Notwithstanding this division, the most interesting phenomenon was an invisible struggle between the United States and China. From the perspective of international politics, the most serious issue in the 21st century will be whether China will challenge the U.S. dominant position in the international order, and if so, when and how it will. We can detect China's true intentions and strategy for a new international order by examining the actions and policies it has been taking in dealing with the international financial crisis. The game in the 21st century financial crisis is actually a game between the United States and China. It is reminiscent of the Great Game between the United Kingdom and Russia in the 19th century. In that Great Game Britain staged all-out military and diplomatic moves to contain Russia's attempt to control Central Asia, particularly India. U.S. President Obama said, shortly after the international financial crisis, that we are entering the beginning of the end of the crisis. I would say that we are entering the beginning of the end of U.S. hegemony in the world. The United States was one of the superpowers during the cold war period and has been the hegemonic power in the world since the end of the cold war. There are similarities and differences between British hegemony and American hegemony. Both hegemonic powers were able to contain the challenger (Russia/ the Soviet Union) and other rising great powers opposed the challenger. Moreover, both hegemonic powers were in control of the international financial order and the international political and security order, both of which are two basic requirements for global hegemony. One difference is that Britain used naked military power to dominate the world, but the U.S. has alternated soft and hard power and relied on nuclear parity. Now we are witnessing the beginning of the end of the international economic order based on the Bretton Woods financial institutions as well as the international security order sustained by American military superiority. The G20 summit signaled the beginning of a new Great Game between the United States and China. This new Great Game has started with a money game, but it will eventually develop into a full-pledged political game. Let us read the signs indicating this. In a hierarchical international system, the hegemonic power maintains a constant watch on the rising great powers. Historically, rising great powers are divided into the powers satisfied with or tolerating the status quo and those against it. When a rising power challenges the status quo, other great powers may support or oppose it. In most cases, the challenger acts alone and is defeated. In the United States, expert opinions are divided on the true foreign policy goals of China. Some argue that it will challenge U.S. hegemony singularly or in alliance with other great powers, and others hold that it will seek peaceful coexistence, believing that the U.S. will not be able to maintain its hegemonic position for long. Still others aver that it will seek a multipolar world, with China in control of East Asia. We can conceive of other scenarios after U.S. hegemony. The international financial crisis has provided China with both a crisis and an opportunity: the economic recession for China and the restructuring of the unipolar international political order and economic and financial architecture. China leading the developing world and in coalition with some major powers including Russia, France and Germany, have been advocating a multipolar international political and economic order. This time China, in league with other members of the BRICs and the Franco-German alliance, pushes for the creation of a new international reserve currency replacing the U.S. dollar. If this is realized, the U.S. will lose its hegemony in the international economic order and therefore it has rejected it. Along with this reform proposal, China, together with major economic powers from diverse continents including Japan, Britain, France, Germany, Russia, the euro zone, Canada, Indonesia, Mexico, and Saudi Arabia, endorses the restructuring of the International Monetary Fund. However, it should be noted that it does not advocate the abolition of the IMF. China's grand strategy was established when Deng Xiaoping adopted a new economic policy in the 1970s, and it has not changed. This strategy is to "rise in peace." The question to others is "for what purpose?" No wonder U.S. leaders and China specialists are divided on the proper U.S. China strategy. They talk about confrontation, containment, containment-engagement, engagement and appeasement. Obama seems to be leaning toward engagement. "The voracious U.S. economy can no longer be the sole engine of global growth." Park Sang-seek is a professor at the Graduate Institute of Peace Studies, Kyung Hee University. - Ed. Not much substantive news was expected to come out of the G-20 meetings that ended on April 2 in London – certainly no good news was even suggested. Europe, China and the United States had too deeply distinct interests. American diplomats wanted to lock foreign countries into further dependency on paper dollars. The rest of the world sought a way to avoid giving up real output and ownership of their resources and enterprises for yet more hot-potato dollars. In such cases one expects a parade of smiling faces and statements of mutual respect for each others’ position – so much respect that they have agreed to set up a “study group” or two to kick the diplomatic ball down the road. The least irrelevant news was not good at all: The attendees agreed to quadruple IMF funding to $1 trillion. Anything that bolsters IMF authority cannot be good for countries forced to submit to its austerity plans. They are designed to squeeze out more money to pay the world’s most predatory creditors. So in practice this G-20 agreement means that the world’s leading governments are responding to today’s financial crisis with “planned shrinkage” for debtors – a 10 per cent cut in wage payments in hapless Latvia, Hungary put on rations, and permanent debt peonage for Iceland for starters. This is quite a contrast with the United States, which is responding to the downturn with a giant Keynesian deficit spending program, despite its glaringly unpayable $4 trillion debt to foreign central banks. In Ukraine, a physical fight broke out in Parliament when the Party of Regions blocked an agreement with the IMF calling for government budget cutbacks. And rightly so! The IMF’s operating philosophy is the destructive (indeed, toxic) belief that imposing a deeper depression with more unemployment will reduce wage levels and living standards by enough to pay debts already at unsustainable levels, thanks to the kleptocracy’s tax “avoidance” and capital flight. The IMF trillion-dollar bailout is actually for these large international banks, so that they will be able to take their money and run. The problem is all being blamed on labor. That is the neo-Malthusian spirit of today’s neoliberalism. The main beneficiaries of IMF lending to Latvia, for example, have been the Swedish banks that have spent the last decade funding that country’s real estate bubble while doing nothing to help develop an industrial potential. Latvia has paid for its imports by exporting its male labor of prime working age, acting as a vehicle for Russian capital flight – and borrowing mortgage purchase-money in foreign currency. To pay these debts rather than default, Latvia will have to lower wages in its public sector by 10 per cent -- and this with an economy already depressed and that the government expects to shrink by 12 percent this year! The insolvency problem of the post-Soviet economies is not entirely the IMF’s fault, to be sure. The European Community deserves a great deal of blame. Instead of viewing the post-Soviet economies as wards to be brought up to speed with Western Europe, the last thing the EU wanted was to develop potential rivals. It wanted customers – not only for its exports, but most of all for its loans. The Baltic States passed into the Scandinavian sphere, while Austrian banks carved out financial spheres of influence in Hungary (and lost their shirt on real estate loans, much as the Habsburgs and Rothschilds did in times past). Iceland was neoliberalized, largely in ripoffs organized by German banks and British financial sharpies. In fact, Iceland ( where I’m writing these lines) looks like a controlled experiment – a very cruel one – as to how deeply an economy can be “financialized” and how long its population will submit voluntarily to predatory financial behavior. If the attack were military, it would spur a more alert response. The trick is to keep the population from understanding the financial dynamics at work and the underlying fraudulent character of the debts with which it has been saddled – with the complicit aid of its own local oligarchy. In today’s world, the easiest way to obtain wealth by old-fashioned “primitive accumulation” is by financial manipulation. This is the essence of the Washington Consensus that the G-20 support, using the IMF in its usual role as enforcer. 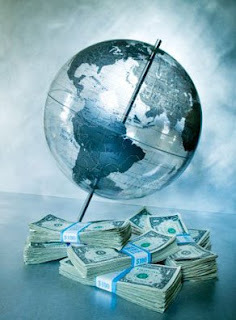 The G-20’s announcement continues the U.S. Treasury and Federal Reserve bank bailout over the past half-year. In a nutshell, the solution to a debt crisis is to be yet more debt. If debtors can’t pay out of what they are able to earn, lend them enough to keep current on their carrying charges. Collateralize this with their property, their public domain, their political autonomy – their democracy itself. The aim is to keep the debt overhead in place. This can be done only by keeping the volume of debts growing exponentially as they accrue interest, which is added onto the loan. This is the “magic of compound interest.” It is what turns entire economies into Ponzi schemes (or Madoff schemes as they are now called). This is “equilibrium”, neoliberal style. In addition to paying an exorbitant basic interest rate, homeowners must pay a special 18 per cent indexation charge on their debts to reflect the inflation rate (the consumer price index) so that creditors will not lose the purchasing power over consumer goods. Labor’s wages are not indexed, so defaults are spreading and the country is being torn apart with bankruptcy, causing the highest unemployment rate since the Great Depression. The IMF approves, announcing that it can find no reason why homeowners cannot bear this burden! Meanwhile, democracy is being torn apart by a financial oligarchy, whose interests have become increasingly cosmopolitan, looking at the economy as prey to be looted. A new term is emerging: “codfish republic” (known further south as banana republics). Many of Iceland’s billionaires these days are choosing to join their Russian counterparts living in London – and the Russian gangsters are reciprocating by visiting Iceland even in the dead of winter, ostensibly merely to enjoy its warm volcanic Blue Lagoon, or so the press is told. The alternative is for debtor countries to suffer the same kind of economic sanctions as Iran, Cuba and pre-invasion Iraq. Perhaps soon there will be enough such economies to establish a common trading area among themselves, possibly along with Venezuela, Colombia and Brazil. But as far as the G-20 is concerned, aid to Iceland and “doing the right thing” is simply a bargaining chip in the international diplomatic game. Russia offered $4 billion aid to Iceland, but retracted it – presumably when Britain gave it a plum as a tradeoff. The IMF’s $1 trillion won’t help the post-Soviet and Third World debtor countries pay their foreign debts, especially their real estate mortgages denominated in foreign currency. This practice has violated the First Law of national fiscal prudence: Only permit debts to be taken on that are in the same currency as the income that is expected to be earned to pay them off. But the G-20’s IMF bailout belies this claim. As Turkey was closing out its loan last year, the IMF faced a world with no customers. Nobody wanted to submit to its destructive “conditionalities,” anti-labor policies designed to shrink the domestic market in the false assumption that this “frees” more output for export rather than being consumed at home. In reality, the effect of austerity is to discourage domestic investment, and hence employment. Economies submitting to the IMF’s “Washington Consensus” become more and more dependent on their foreign creditors and suppliers. The United States and Britain would never follow such conditionalities. That is why the United States has not permitted an IMF advisory team to write up its prescription for U.S. “stability.” The Washington Consensus is only for export. (“Do as we say, not as we do.”) Mr. Obama’s stimulus program is Keynesian, not an austerity plan, despite the fact that the United States is the world’s largest debtor. Here’s why the situation is unsustainable. What has enabled the Baltics and other post-Soviet countries to cover the foreign-exchange costs of their trade dependency and capital flight has been their real estate bubble. The neoliberal idea of financial “equilibrium” has been to watch “market forces” shorten lifespans, demolish what industrial potential they had, increase emigration and disease, and run up an enormous foreign debt with no visible way of earning the money to pay it off. This real estate bubble credit was extractive and parasitic, not productive. From the creditor’s vantage point, knowing that the Great Neoliberal Bubble is over, the trick is to deter debtor countries from acting to resolve its collapse in a way that benefits themselves. The aim is to take as much as possible – and to get the IMF and central banks to bail out the poisonous banks that have loaded these countries down with toxic debt. Grab what you can while the grabbing is good. And demand that debtors do what Latin American and other third World countries have been doing since the 1980s: sell off their public domain and public enterprises at distress prices. That way, the international banks not only will get paid, they will get new business lending to the buyers of the assets being privatized – on the usual highly debt-leveraged terms! The preferred tactic do deter debtor countries from acting in their self-interest is to pound on the old morality, “A debt is a debt, and must be paid.” That is what Herbert Hoover said of the Inter-Ally debts owed by Britain, France and other allies of the United States in World War I. These debts led to the Great Depression. “We loaned them the money, didn’t we?” he said curtly. Let’s look more closely at the moral argument. Living in New York, I find an excellent model in that state’s Law of Fraudulent Conveyance. Enacted when the state was still a colony, it was enacted in response British speculators making loans to upstate farmers, and demanding payment just before the harvest was in, when the debtors could not pay. The sharpies then foreclosed, getting the land on the cheap. So New York’s Fraudulent Conveyance law responded by establishing the legal principle that if a creditor makes a loan without having a clear and reasonable understanding of how the debtor can repay the money in the normal course of doing business, the loan is deemed to be predatory and therefore null and void. At issue is just what a “free market” is. It’s supposed to be one of choice. Indebted countries lose discretionary choice over their economic future. Their economic surplus is pledged abroad as financial tribute. Without the overhead costs of a military occupation, they are relinquishing their policy making from democratically elected political representatives to bureaucratic financial managers, often foreign – the new Central Planners in today’s neoliberal world. The best they can do, knowing the game is over, is to hope that the other side doesn’t realize it – and to do everything you can to confuse debtor countries while extracting as much as they can as fast as they can. Will the trick work? Maybe not. While the G-20 meetings were taking place, Korea was refusing to let itself be victimized by the junk derivatives contracts that foreign banks sold. Korea is claiming that bankers have a fiduciary responsibility to their customers to recommend loans that help them, not strip them of money. There is a tacit understanding (one that the financial sector spends millions of dollars in public relations efforts to undermine) that banking is a public utility. It is supposed to be a handmaiden to growth – industrial and agricultural growth and self-sufficiency – not predatory, extractive and hence anti-social. So Korean victims of junk derivatives are suing the banks. As New York Times commentator Floyd Norris described last week, the legal situation doesn’t look good for the international banks. The home court always has an advantage, and every nation is sovereign, able to pass whatever laws it wants. (And as America’s case abundantly illustrates, judges need not be unbiased.) The post-Soviet economies as well as Latin America must be watching attentively the path that Korea is clearing through international courts. The nightmare of international bankers is that these countries may bring the equivalent of a class action suit against the international diplomatic coercion mounted against these countries to lead them down the path of financial and economic suicide. “The Seoul Central District Court justified its decision [to admit the lawsuit] on the kind of logic that would apply in the United States to a lawsuit involving an unsophisticated individual investor and a fast-taking broker. The court pointed to questions of whether the contract was a suitable investment for the company, and to whether the risks were fully disclosed. The judgment also referred to the legal concept of “changed circumstances,” concluding that the parties had expected the exchange rate to remain stable, that the change in circumstances was unforeseeable and that the losses would be too great for the company to bear.” As a second cause of action, Korea is claiming that the banks provided creditor for other financial institutions to bet against the very contracts the banks were selling Korea to “protect” its interests. So the banks knew that what they were selling was a time bomb, and therefore seem guilty of conflict of interest. Banks claim that they merely were selling goods with no warranty to “informed individuals.” But the Korean parties in question were no more informed than were Iceland’s debtors. If a bank seeks to mislead and does not provide full disclosure, its victim cannot be said to be “informed.” The proper English word is misinformed (viz. disinformation). . Speaking of disinformation, an important issue concerns the extent to which the big international banks may have conspired with domestic bankers and corporate managers to loot their companies. This is what corporate raiders have done for their junk-bond holders since the high tide of Drexel Burnham and Michael Milken in the 1980s. This would make the banks partners in crime. There needs to be an investigation of the lending pattern that these banks engaged in – including their aid in organizing offshore money laundering and tax evasion to their customers. No wonder the IMF and British bankers are demanding that Iceland make up its mind in a hurry, and commit itself to pay astronomical debts without taking the time to ask just how they are to pay – and investigating the creditor banks’ overall lending pattern! Bearing the above in mind, I suppose I can tell Icelandic politicians that I have good news regarding the fate of their country’s foreign and domestic debt: No nation ever has paid its debts. As I noted above, this means that the real question is not whether or not they will be paid, but how not to pay these debts. Do they want to continue the fight by Enlightenment and Progressive Era social democracy, or the alternative – a lapse back into neofeudal debt peonage? This is the choice must be made. And it is largely a question of timing. That’s what the financial sector plays for – time enough to transfer as much property as it can into the hands of the banks and other investors. That’s what the IMF advises debtor countries to do – except of course for the United States as largest debtor of all. This is the underlying lawless character of today’s post-bubble debts. I am traveling in Europe for three weeks to discuss the global financial crisis with government officials, politicians and labor leaders. What is most remarkable is how differently the financial problem is perceived over here. It's like being in another economic universe, not just another continent. Strange as it may seem ­ and irrational as it would be in a more logical system of world diplomacy ­ the "dollar glut" is what finances America's global military build-up. It forces foreign central banks to bear the costs of America's expanding military empire ­ effective "taxation without representation." Keeping international reserves in "dollars" means recycling their dollar inflows to buy U.S. Treasury bills ­ U.S. government debt issued largely to finance the military. To date, countries have been as powerless to defend themselves against the fact that this compulsory financing of U.S. military spending is built into the global financial system. Neoliberal economists applaud this as "equilibrium," as if it is part of economic nature and "free markets" rather than bare-knuckle diplomacy wielded with increasing aggressiveness by U.S. officials. The mass media chime in, pretending that recycling the dollar glut to finance U.S. military spending is "showing their faith in U.S. economic strength" by sending "their" dollars here to "invest." It is as if a choice is involved, not financial and diplomatic compulsion to choose merely between "Yes" (from China, reluctantly), "Yes, please" (from Japan and the European Union) and "Yes, thank you" (Britain, Georgia and Australia). It is not "foreign faith in the U.S. economy" that leads foreigners to "put their money here." This is a silly anthropomorphic picture of a more sinister dynamic. The "foreigners" in question are not consumers buying U.S. exports, nor are they private-sector "investors" buying U.S. stocks and bonds. The largest and most important foreign entities putting "their money" here are central banks, and it is not "their money" at all. They are sending back the dollars that foreign exporters and other recipients turn over to their central banks for domestic currency. When the U.S. payments deficit pumps dollars into foreign economies, these banks are being given little option except to buy U.S. Treasury bills and bonds ­ which the Treasury spends on financing an enormous, hostile military build-up to encircle the major dollar-recyclers ­ China, Japan and Arab OPEC oil producers. Yet these governments are forced to recycle dollar inflows in a way that funds U.S. military policies in which they have no say in formulating, and which threaten them more and more belligerently. That is why China and Russia took the lead in forming the Shanghai Cooperation Organization (SCO) a few years ago. Congress has told foreign investors in the largest dollar holder, China, not to buy anything except perhaps used-car dealerships and maybe more packaged mortgages and Fannie Mae stock ­ the equivalent of Japanese investors being steered into spending $1 billion for Rockefeller Center, on which they subsequently took a 100% loss, and Saudi investment in Citigroup. That's the kind of "international equilibrium" that U.S. officials love to see. "CNOOK go home" is the motto when it comes to serious attempts by foreign governments and their sovereign wealth funds (central bank departments trying to figure out what to do with their dollar glut) to make direct investments in American industry. The military overhead is much like a debt overhead, extracting revenue from the economy. In this case it is to pay the military-industrial complex, not merely Wall Street banks and other financial institutions. The domestic federal budget deficit does not stem only from "priming the pump" to give away enormous sums to create a new financial oligarchy. It contains an enormous and rapidly growing military component. So Europeans and Asians see U.S. companies pumping more and more dollars into their economies, not only to buy their exports in excess of providing them with goods and services in return, and not only to buy their companies and "commanding heights" of privatized public enterprises without giving them reciprocal rights to buy important U.S. companies (remember the U.S. turn-down of China's attempt to buy into the U.S. oil distribution business), and not only to buy foreign stocks, bonds and real estate. The U.S. media somehow neglect to mention that the U.S. Government is spending hundreds of billions of dollars abroad ­ not only in the Near East for direct combat, but to build enormous military bases to encircle the rest of the world, to install radar systems, guided missile systems and other forms of military coercion, including the "color revolutions" that have been funded ­ and are still being funded ­ all around the former Soviet Union. Pallets of shrink-wrapped $100 bills adding up to tens of millions of the dollars at a time have become familiar "visuals" on some TV broadcasts, but the link is not made with U.S. military and diplomatic spending and foreign central-bank dollar holdings, which are reported simply as "wonderful faith in the U.S. economic recovery" and presumably the "monetary magic" being worked by Wall Street's Tim Geithner at Treasury and Helicopter Ben Bernanke at the Federal Reserve. Here's the problem: The Coca Cola company recently tried to buy China's largest fruit-juice producer and distributor. China already holds nearly $2 trillion in U.S. securities ­ way more than it needs or can use, inasmuch as the United States Government refuses to let it buy meaningful U.S. companies. If the U.S. buyout would have been permitted to go through, this would have confronted China with a dilemma: Choice #1 would be to let the sale go through and accept payment in dollars, reinvesting them in what the U.S. Treasury tells it to do ­U.S. Treasury bonds yielding about 1%. China would take a capital loss on these when U.S. interest rates rise or when the dollar declines as the United States alone is pursuing expansionary Keynesian policies in an attempt to enable the U.S. economy to carry its debt overhead. Academic textbooks have nothing to say about how "equilibrium" in foreign capital movements ­ speculative as well as for direct investment ­ is infinite as far as the U.S. economy is concerned. The U.S. economy can create dollars freely, now that they no longer are convertible into gold or even into purchases of U.S. companies, inasmuch as America remains the world's most protected economy. It alone is permitted to protect its agriculture by import quotas, having "grandfathered" these into world trade rules half a century ago. Congress refuses to let "sovereign wealth" funds invest in important U.S. sectors. So we are confronted with the fact that the U.S. Treasury prefers foreign central banks to keep on funding its domestic budget deficit, which means financing the cost of America's war in the Near East and encirclement of foreign countries with rings of military bases. The more "capital outflows" U.S. investors spend to buy up foreign economies ­the most profitable sectors, where the new U.S. owners can extract the highest monopoly rents ­ the more funds end up in foreign central banks to support America's global military build-up. No textbook on political theory or international relations has suggested axioms to explain how nations act in a way so adverse to their own political, military and economic interests. Yet this is just what has been happening for the past generation. So the ultimate question turns out to be what countries can do to counter this financial attack. A Basque labor union asked me whether I thought that controlling speculative capital movements would ensure that the financial system would act in the public interest. Or is outright nationalization necessary to better develop the real economy? It is not simply a problem of "regulation" or "control of speculative capital movements." The question is how nations can act as real nations, in their own interest rather than being roped into serving whatever U.S. diplomats decide is in America's interest. Any country trying to do what the United States has done for the past 150 years is accused of being "socialist" ­ and this from the most anti-socialist economy in the world, except when it calls bailouts for its banks "socialism for the rich," a.k.a. financial oligarchy. This rhetorical inflation almost leaves no alternative but outright nationalization of credit as a basic public utility. Of course, the word "nationalization" has become a synonym for bailing out the largest and most reckless banks from their bad loans, and bailing out hedge funds and non-bank counterparties for losses on "casino capitalism," gambling on derivatives that AIG and other insurers or players on the losing side of these gambles are unable to pay. Such bailouts are not nationalization in the traditional sense of the term ­ bringing credit creation and other basic financial functions back into the public domain. It is the opposite. It prints new government bonds to turn over ­ along with self-regulatory power ­ to the financial sector, blocking the citizenry from taking back these functions. Framing the issue as a choice between democracy and oligarchy turns the question into one of who will control the government doing the regulation and "nationalizing." If it is done by a government whose central bank and major congressional committees dealing with finance are run by Wall Street, this will not help steer credit into productive uses. It will merely continue the Greenspan-Paulson-Geithner era of more and larger free lunches for their financial constituencies. The financial oligarchy's idea of "regulation" is to make sure that deregulators are installed in the key positions and given only a minimal skeleton staff and little funding. Despite Mr. Greenspan's announcement that he has come to see the light and realizes that self-regulation doesn't work, the Treasury is still run by a Wall Street official and the Fed is run by a lobbyist for Wall Street. To lobbyists the real concern isn't ideology as such ­ it's naked self-interest for their clients. They may seek out well-meaning fools, especially prestigious figures from academia. But these are only front men, headed as they are by the followers of Milton Friedman at the University of Chicago. Such individuals are put in place as "gate-keepers" of the major academic journals to keep out ideas that do not well serve the financial lobbyists. This pretence for excluding government from meaningful regulation is that finance is so technical that only someone from the financial "industry" is capable of regulating it. To add insult to injury, the additional counter-intuitive claim is made that a hallmark of democracy is to make the central bank "independent" of elected government. In reality, of course, that is just the opposite of democracy. Finance is the crux of the economic system. If it is not regulated democratically in the public interest, then it is "free" to be captured by special interests. So this becomes the oligarchic definition of "market freedom." The danger is that governments will let the financial sector determine how "regulation" will be applied. Special interests seek to make money from the economy, and the financial sector does this in an extractive way. That is its marketing plan. Finance today is acting in a way that de-industrializes economies, not builds them up. The "plan" is austerity for labor, industry and all sectors outside of finance, as in the IMF programs imposed on hapless Third World debtor countries. The experience of Iceland, Latvia and other "financialized" economies should be examined as object lessons, if only because they top the World Bank's ranking of countries in terms of the "ease of doing business." The only meaningful regulation can come from outside the financial sector. Otherwise, countries will suffer what the Japanese call "descent from heaven": regulators are selected from the ranks of bankers and their "useful idiots." Upon retiring from government they return to the financial sector to receive lucrative jobs, "speaking engagements" and kindred paybacks. Knowing this, they regulate in favor of financial special interests, not that of the public at large. The problem of speculative capital movements goes beyond drawing up a set of specific regulations. It concerns the scope of national government power. The International Monetary Fund's Articles of Agreement prevent countries from restoring the "dual exchange rate" systems that many retained down through the 1950s and even into the Œ60s. It was widespread practice for countries to have one exchange rate for goods and services (sometimes various exchange rates for different import and export categories) and another for "capital movements." Under American pressure, the IMF enforced the pretence that there is an "equilibrium" rate that just happens to be the same for goods and services as it is for capital movements. Governments that did not buy into this ideology were excluded from membership in the IMF and World Bank ­ or were overthrown. The implication today is that the only way a nation can block capital movements is to withdraw from the IMF, the World Bank and the World Trade Organization (WTO). For the first time since the 1950s this looks like a real possibility, thanks to worldwide awareness of how the U.S. economy is glutting the global economy with surplus "paper" dollars ­ and U.S. intransigence at stopping its free ride. From the U.S. vantage point, this is nothing less than an attempt to curtail its international military program. Obama and his public relations team have made it appear that his trillion dollars in higher taxes will fall only on "the rich." Obama stresses that his tax increase is only for the richest 5 percent of Americans, while the other 95 percent receive a tax cut. The fact of the matter is that the income differences within the top 5 percent are far wider than the differences between the lower tax brackets and the "rich" American in the 96th percentile. For Obama, being "rich" begins with $250,000 in annual income, the bottom rung of the top 5 percent. Compare this "rich" income to that of, for example, Hank Paulson, President George W. Bush's treasury secretary when he was the head of Goldman Sachs. In 2005, Paulson was paid $38.3 million in salary, stock and options. That is 153 times the annual income of the "rich" $250,000 person. Despite his massive income, Paulson himself was not among the super rich of that year, when a dozen hedge fund operators made $1 billion. The hedge fund honchos incomes were 26 times greater than Paulson's and 4,000 times greater than the "rich" man's or family's $250,000. For most Americans, a $250,000 income would be a godsend, but envy can make us blind. A $250,000 income is not one that will support a rich lifestyle. Moreover, many people prefer lesser incomes to the years of education, long work hours and stress of personal liability that are associated with many $250,000 incomes. In truth, those with $250,000 gross incomes have more in common with those at the lower end of the income distribution than with the rich. A $250,000 income is 10 times greater than a $25,000 income, not hundreds or thousands of times greater. On an after-tax basis, the difference shrinks to about six times. The American tax code taxes the $250,000 income at the same rate as it taxes a $100,000,000 or higher income. On an after-tax basis, after the federal government grabs 30 percent in income taxes and state government grabs 6 percent, the "rich" man or woman or family earning $250,000 has $160,000. In New York City, where there is a city income tax in addition to state and federal, this sum diminishes further. State sales taxes take another 6 or more percent of most consumption expenditures. When all is said and done, the after-tax value of a $250,000 income in New York City is about $140,000. Is this rich? It might be in a small town in Alabama, but not in New York City. The "rich" person or family won't be purchasing a Manhattan apartment, much less a brownstone. They won't be driving a luxury car. Indeed, they won't be able to afford a parking garage for an economy car. If they fly anywhere, it won't be in a first-class seat. For the most part, $250,000 incomes are located in large cities where the cost of living is high. For example, a husband and wife who are associates at major law firms, each of whom works 60-hour weeks and has no job security, earn $125,000 each. They might both have student loans to pay down. For the Obama administration to lump these people in with Hank Paulson or billionaire hedge fund operators is propagandistic. What is the difference between the $250,000 "rich" income and the $245,000 "non-rich" income? After Obama's tax scheme goes into effect, the $245,000 income will benefit from a tax cut, and the $250,000 will have a tax increase. Will people in the 96th percentile ask for pay cuts that will drop them into the 95th percentile? In America, the truly rich are those in the top 0.5 percent of the income distribution. These are the people with yachts and private airplanes, and who are still rich after they lose half their wealth in a stock market collapse caused by government policy that accommodated financial gangsters. "Oh, well, I was worth $600,000,000 last year and only $300,000,000 this year. Perhaps we should stop drinking $1,000 bottles of rare vintages and move down to $100-a-bottle wines. Probably shouldn't buy that new yacht or that villa in the south of France." The upper middle class with $250,000 gross incomes are major losers of the financial collapse. Many of the people in this income class are leveraged to the hilt in order to maintain appearances and can be swept away as easily as the very poor. But those who were frugal and invested for their future have lost 50 percent of their savings. These wiped out people are the ones who will bear the brunt of Obama's tax increase. If the tax rate on a multimillion dollar annual income goes up by 5 percentage points, the cutbacks won't really affect the lifestyle. But for the $250,000 gross income group, it means no prospect of private schools and Ivy League education for the children, who will be attending state colleges with the rest of the non-rich. Obama is attacking the only income class that has any independence — the upper-middle-class professionals. The real rich are few in number and seldom present any opposition to government. Recently, the March 23, 2009, New York Times reported that the 400 richest Americans' "share of the nation's total wealth has nearly doubled to more than 22 percent." The average income of the 400 richest Americans is $263 million annually. That is 1,052 times the income of the "rich" $250,000 income. What the Obama administration is really doing is taxing ordinary people in order to bail out the super-rich. The 95 percent of Americans who get the tax cut will find that it is offset many times by the depreciation in the dollar and the raging inflation that will result from monetizing the multitrillion-dollar budget deficits made necessary by the bailouts of the banksters. In the United States, government has become expert at manipulating both left-wing and right-wing ideologies. It keeps those on both ends of the spectrum set at each other's throats in order to ensure the government's continuing independence from accountability. Historically, the definition of a free person is a person who owns his own labor. Serfs were not free because they owed their feudal lords, the government of that time, a maximum of one-third of their labor. Nineteenth century slaves were not free because their owners could expropriate 50 percent of their labor. Today, no American is a free person. The lowest tax rate, not counting state income, property tax and sales tax, is 15 percent Social Security tax and 15 percent federal income tax. The "free American" starts off with a 30 percent tax rate, the position of a medieval serf. In medieval Europe, when tax rates reached beyond 30 percent, serfs rebelled and killed their masters. In the case of a major crisis, one must get to the heart of the matter. The only choice is between undertaking a number of radical changes, thus greatly shortening the duration of the crisis and diminishing its tragic outcome or, on the contrary, refusing to make any such changes in an attempt to save what is left of the present system, thus extending the crisis’ duration and increasing all the negative consequences. In London, next April 2nd, you can either pave the way for the crisis to be solved in an organised manner in 3 to 5 years, or drag the world through a terrible decade. We will content ourselves with giving you three recommendations that we consider strategic ones in the sense that, according to LEAP/E2020, if they have not been initiated by this summer 2009, global geopolitical dislocation will become inevitable from the end of this year onward. The second recommendation has already been mentioned many times in the preliminary debates to your upcoming summit. It should therefore be easy to adopt. It is about creating, before the end of this year, a scheme of bank control on a global scale, suppressing all the system’s « black holes ». A number of options have already been suggested by your experts. Make up your mind now: nationalize financial institutions as soon as is necessary! It is the only way to prevent a new episode of massive indebtment by them (the kind of episode which significantly contributed to the current crisis), and to show to the general public that you have some credibility to deal with bankers. The third recommendation relates to a politically sensitive issue, which cannot be ignored. It is essential that, no later than July 2009, the imf presents to the G20 an independent assessment of the three national financial systems at the heart of the current financial crisis: US, UK and Switzerland. No sustainable recommendation can be efficiently implemented as long as no one has any clear understanding of the damage caused by the crisis inside these three pillars of the global financial system. It is no longer time to be polite with the countries located at the centre of the current financial chaos. Write a simple and short statement! Finally, please allow us to remind you that your task is to restore confidence among 6 billion people and among millions of public and private organisations. Therefore do not forget to write a short statement – no more than 2 pages, presenting a maximum of 3 to 4 key ideas that non-experts can read and understand. If you fail to do so, no one will read what you have to say apart from a narrow circle of specialists, therefore you will not revive confidence among the general public and the crisis will be doomed to get worse. If this open letter helps you to feel that History will judge you according to the success or failure of this Summit, then it has been useful. According to LEAP/E2020, your citizens will not wait any longer than a year before they judge you. This time at least, you will not be able to say no one warned you!